Dingonek Street Band is a Brooklyn-based brass band dedicated to human culture and sonic adventure. Built on the celebratory energy and raw spontaneity of the second-line brass band tradition, Dingonek has created a funky, high-energy party music all their own by absorbing and reworking elements of Afrobeat, Ethio-jazz, punk rock, free jazz, and Balkan brass music. 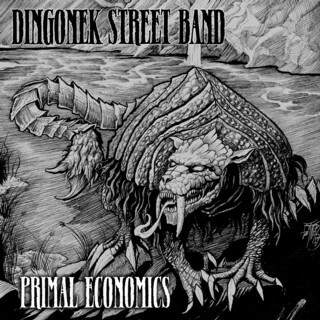 Primal Economics is Dingonek’s dynamic debut featuring eight original compositions penned by trumpeter Bobby Spellman. Each track is a wild blending of worlds, mixing African rhythms with jazz improvisation, Romani scales with second-line grooves, brass and reeds with drums, gongs, bells, and broken glass. The fast-paced instrumental adventure finds the band taking creative risks without losing hold of the earthy grooves that form the foundation for party music the world over.